I am posting this from my awesome phone mostly because I can:-). Not bad for only five hours right? 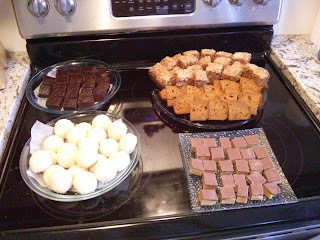 Carrot cake, Coconut macaroons, Pumpkin bread, banana brownies, and peanut butter cup bars. Recipes to come. Probably posted while I'm in Austin..... For ten days *frown*. I was going to say that's early for TG, 2013, but then I realized you are in Canada. Now it makes sense! You are quite the baker and you don't seem nuts!! Thanks Gloria :). Though I think plenty of people would disagree with you on the nuttiness thing :). Hey, you could look up Anna from Cookie Madness down in Austin!! I would eat everything you have on those plates if I could. Actually we're going to try and get together, especially since we couldn't when I was down there in August :). *fingers crossed* It works out this time :).